Rev. 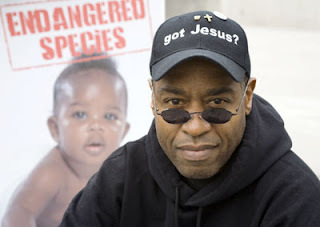 Walter Hoye and Personhood USA's Cal Zastrow will speak Sunday, December 6, 09 at Cinzetti's in north Denver. For reservations, call Colorado RTL. Walter Hoye, 52, of Union City was the first person convicted under an Oakland ordinance barring protesters from coming within 8 feet of anyone entering an abortion clinic. In February, Judge Stuart Hing of Alameda County Superior Court sentenced Hoye to three years' probation and 30 days in jail, and ordered him to pay $1,000. Hoye could have disposed of the jail time in a sheriff's work detail or by volunteering. But he balked at the judge's order to stay 100 yards from Family Planning Specialists Medical Group at Second and Webster streets. Hoye argued that the order was more severe than Oakland's ordinance and stifled his First Amendment rights. Hing refused to budge at a hearing Friday at which Hoye's attorneys tried to stay the sentence pending an appeal. The judge asked Hoye to decide whether he wished to serve a month in jail or in an alternative program, and the pastor chose jail. Supporters shouted, "We love you, Walter," and clapped as Hoye was led away by sheriff's deputies. Hoye could have faced up to two years in jail after a jury convicted him in January of two misdemeanor counts of unlawfully approaching patients at the clinic. The Oakland City Council established "medical safety zones" around abortion clinics in 2007. Abortion protesters must stay at least 8 feet from women, staffers or escorts entering the buildings. The council passed the law in response to complaints of harassment at three abortion clinics in the city. Hoye, executive elder of the Progressive Missionary Baptist Church in south Berkeley, hands out anti-abortion literature outside abortion clinics. He was arrested May 13 at the Oakland clinic, carrying a sign that read, "Jesus loves you and your baby. Let us help you!"